Around the world, digital oil and gas fields are working to make operations smarter and more cost effective, leveraging the increased numbers of sensors, data sources and connectivity routes available with the advent of new technologies and the IIoT. This level of plant connectivity makes information available in near-real time, empowering users and applications to analyze data at the exact moments they need it. 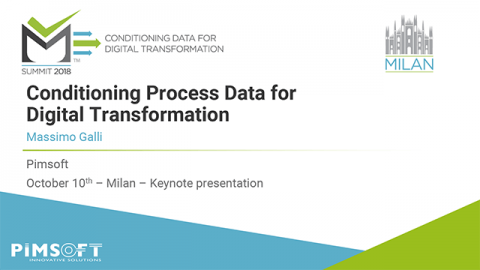 However, this connectivity also requires a new level of data accuracy and consistency; in order for these near-real time analyses to improve plant operations, plant data must be properly validated, reconciled, conditioned and ready for use. 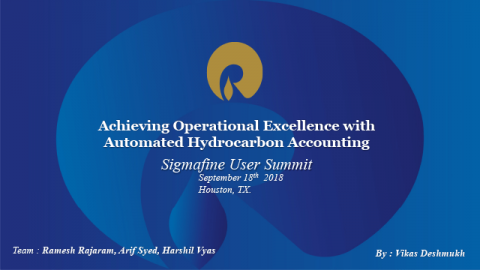 Sigmafine enables the conditioning of data for use in the oil and gas industries with a robust data model that runs periodically and unattended. The model correlates the data coming from sensors located around the field (e.g. wells, the manifold, separator stages, etc.) to create a single and consistent dataset. Within this model, statistical tests simultaneously identify meter performance issues and correct any imbalances (mass or volume) to minimize measurement errors and provide more accurate flow rate estimates. Figure 1 shows the imbalance correction in effect. Sigmafine has applied a large correction to the multiphase flow meter measurement, located before the high-pressure separator. 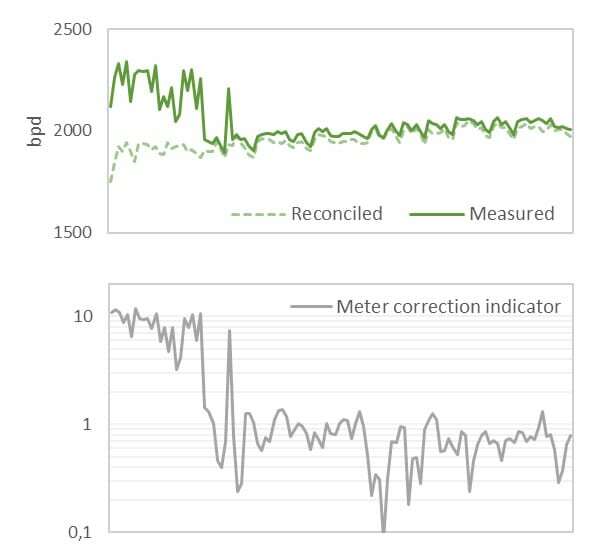 The correction indicator was significantly higher than 1, revealing an unreliable measurement and prompting instrument maintenance. After servicing the instrument, the measured and reconciled values became much closer. This improved data accuracy is possible because the Sigmafine model relies on multiple data sources to confirm data accuracy via redundancy, and thus creates a more reliable meter estimation. In addition to direct measurements, the Sigmafine model can include virtual sensors to infer flow rates from other process data (e.g. vertical lift performance tables and pressure measurements) or integrate with other data sources (e.g. importing flow rates from multi-phase simulations via the Sigmafine Integration Framework). Typically, gas, oil and water content is available after sample analyses are completed online, through well tests or via laboratory analyses. Sigmafine can verify these analyses against the production of gas, oil and re-injected water through an analysis that provides both mass and component balance. This data analysis enforces dataset consistency before new sample analyses are available, reducing the time it takes to detect and act on discrepancies of parameters like the Gas Oil Ratio (GOR). 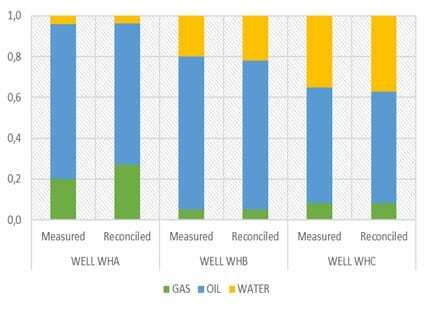 In a case we studied, where fluids from three different wells are being examined, each with a different characterization, the overall imbalance error identified by Sigmafine was higher than 16%. 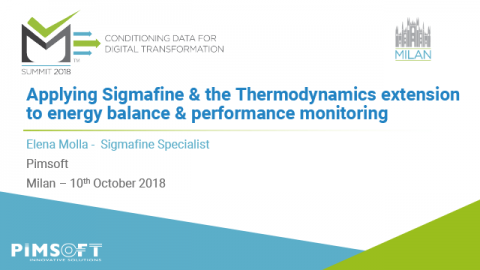 Sigmafine provides uncertainties associated to the reconciled values, therefore it is possible to estimate not only the new GOR value but also the reliability of such KPI . 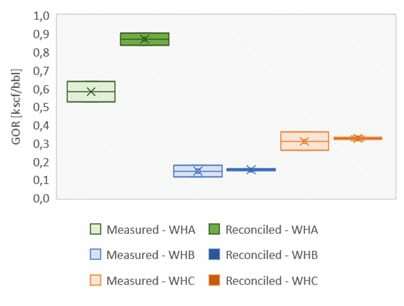 From Figure 4, it is evident that the actual GORs for wells WHB and WHC are still reliable, while the discrepancy in WHA signifies the need for a new analysis. The oil and gas industry is tasked with tracking production levels by source to monitor performance. 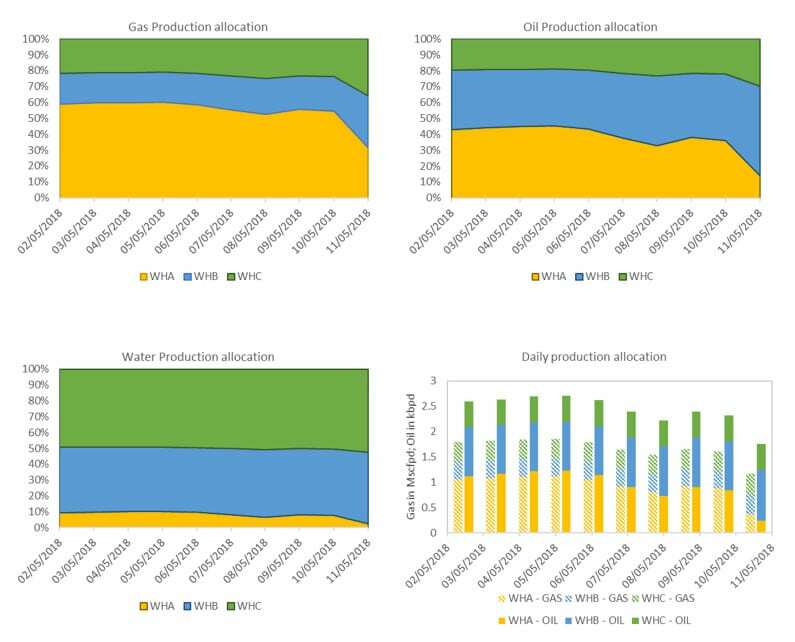 Sigmafine solves this problem by accurately tracking information once a balance model is in place; in the example below, the model tracks the well source (WHA, WHB, WHC), the production of gas and oil, and the water re-injection over time. Figure 5 shows the aggregated daily contribution by well. Furthermore, if a reservoir is owned by multiple entities, Sigmafine can allocate production according to the ownership quota of each source. Figure 6 shows that ownership of the wells is split between a public company and a private company, the latter having two different shareholders (SH1, SH2). 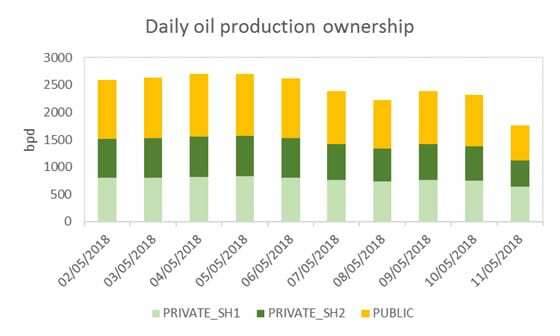 In Figure 7, daily oil production ownership is summarized. This level of tracking arms companies and shareholders with accurate accounting information based on reconciled figures. Finally, Sigmafine’s ability to run unattended makes it a suitable candidate for both a validation layer to integrate into the overall digital infrastructure, as well as a consistency layer to support business intelligence platforms and machine learning.